Standalone midi interface kit for Waveblaster (and compatible) MIDI daughterboards. New revision of the CHiLL high quality compact MIDI interface for Waveblaster (and compatible) MIDI daughterboards. The full kit takes about 30 minutes to build. Download the detailed pdf build instructions here. Connect your Waveblaster compatible MIDI board to any MIDI output. No need for host soundcards anymore! 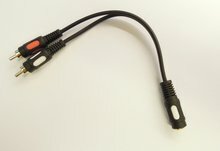 Requires 9V DC adapter : 2.5mm socket. (polarity does not matter). You can find a description of the available headers/connections on the PCB here.